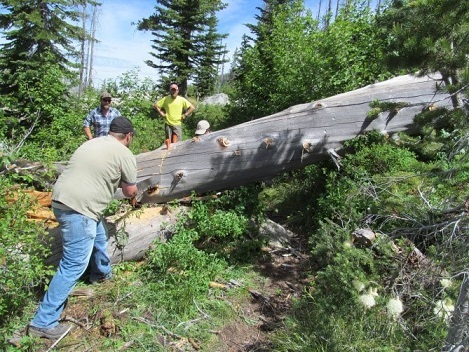 Project: Idaho Trails Association spring cleanup project on English Point trail near Hayden Lake. Date and time: Friday, April 29th starting at 8:00 am, ending by 4:00 pm. Where: We will meet at 8:00 am at the trailhead on English Point Road just off of East Lancaster Road. Volunteers can show up any time during the day. 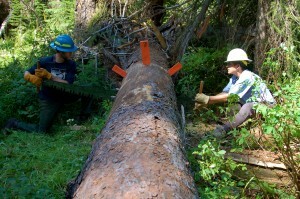 Description: The Idaho Trails Association is looking for volunteers to help do maintenance work on Friday, April, 29th on the English Point Trail #80 in the Idaho Panhandle National Forest . We will be cleaning out water bars, cutting back brush, cleaning mud off bridges, and doing other “spring cleaning” chores. 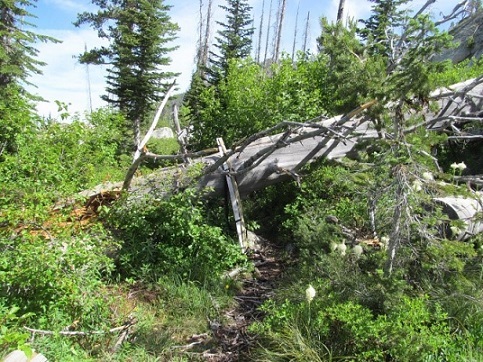 The English Point trail system includes easy loops thru forest terrain on the west side of Hayden Lake. 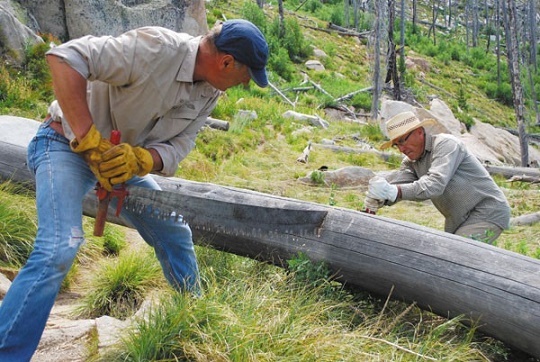 The Idaho Trails Association will be doing the maintenance work to help make this popular trail more enjoyable for the hikers, mountain bikers, and horseback riders who come here. Volunteers will use hand tools provided by the Association to do light work. Everyone should bring work gloves, sturdy shoes, lunch, and water.We will meet at 8:00 am at the trailhead on English Point Road about 3.7 miles east of US 95 on East Lancaster Road. The Roman Nose project has been changed! The new location is the Boulder Meadows trail which is an old closed road converted to single track. It has some erosion issu es so we will be doing water bars and tread work. The Forest Service will be providing tools and a crew leader. Friday, September 9th, Two options for meeting up… We will leave the Bonner Mall (far end of the parking lot by the theater) at 7:30 AM. Option two is to park at the junction of 20 mile rd and Highway 95 just north of Naples. We will be leaving there and heading into the project at 8AM. From highway 95 it’s about 45 minutes in on a decent dirt road, but high clearance vehicles are recommended. Volunteers should bring a lunch and water, wear boots, long sleeves, & eye protection. 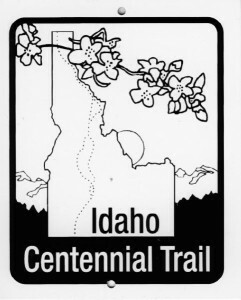 This trail is part of the Idaho Centennial Trail! 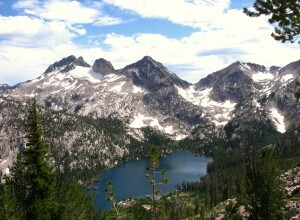 The Boise Weekly published an article about the Idaho Trails Association on July, 2015. It’s a great article on how we got started, our mission, and how we accomplish our mission. Read more here. 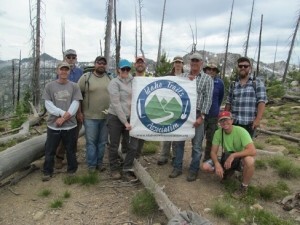 Idaho Trails Association trail work project on July 25th & 26th, 2015 was at Hum Lake on the Krassel District of the Payette National Forest. 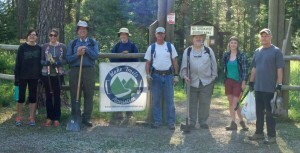 We backpacked into base camp at Hum Lake on Saturday and then divided into two crews and conquered. One group headed north on the trail and did some much needed trail tread work and the other group back tracked on the Hum lake trail and did some light brushing. After completing a day of hard work we got back to camp where the In the Wild Chef had a Scrumptious gourmet backcountry dinner ready for everyone to devour. On Sunday morning after filling up on Blueberry Brie flappers, sausage, and coffee we headed north on the trail again and did more trail tread work, put in some water dips, cleared 25 down trees from the trail and rerouted the trail onto the original tread. Over time the lack of maintenance made it unclear where the original trail was and the cairns along the trail where incorrectly placed. Now with the trees off the trail and the cairns correctly placed; the trail will guide you to a gorgeous saddle with astounding views that span across the vast wild and scenic country. Cleared 25 trees from the trail. Rehabbed approx 1500 feet of trail. Brushed .75 miles of trail. Here are some photos of the crew and the work they accomplished. A BIG THANK YOU goes out to the Krassel National Forest Service, REI, In the Wild Chef, everyone of our sponsors, and the volunteers for making this trail work vacation such a success! 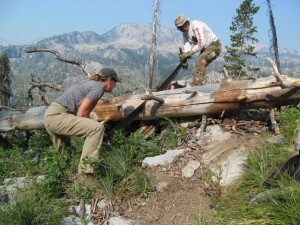 We are thrilled with the work our volunteers accomplished during this Epic trail work vacation in the Sawtooth Wilderness. Our amazing volunteer crew along with a Forest Service Wilderness Ranger got this staggering list of accomplishments done! 10-ITA Volunteers contributed 400 hours of volunteer time. Cleared 7 trees from the trail within Wilderness. Resurfaced 1500 feet of trail through talus slope. Brushed 2.5 miles of trail. Removed rocks from 3 miles of trail. Built 150 feet of rock retaining wall for 2 trail realignments. Rehabbed 150 feet of trail at realignments. Built 20 foot approach ramp for bridge. Picked up and packed out 30 pounds of trash from Twin Lakes area. 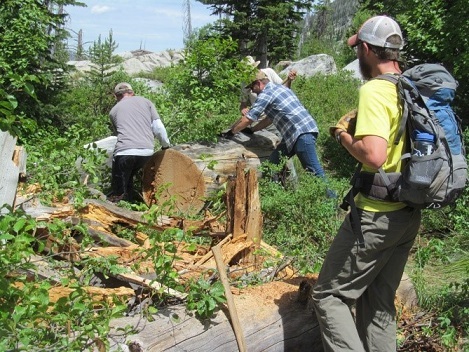 A BIG THANK YOU goes out to the Sawtooth National Forest Service, The Sawtooth Society, REI, Cabela’s, and our volunteers for making this trail work vacation such a success!